With more than 40 golf courses, 500 public parks and thousands of miles of paths for biking, running or walking and the miles of beaches, South Florida is truly an outdoor lover’s paradise. For sports addicts, South Florida is home to a professional sports team for all of the major sports. The NFL’s Miami Dolphins, NBA’s Miami Heat, baseball’s Florida Marlins, hockey’s Florida Panthers and the Miami SOL of the women’s national basketball association all play their home games in South Florida. Other sporting events come to South Florida on a yearly basis, including major golf tournaments such as The Honda Classic and the Genuity Championship, NASCAR and Indy racing at the Miami Homestead-Miami Speedway, and championship tennis at the Nasdaq-100 Open. 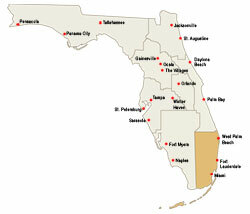 And for a local flavor, try the area’s pari-mutuels – greyhound and horse racing and jai-alai. Music, theater and art buffs are never at a loss for things to do. The Miami City Ballet, Florida Philharmonic and the New World Symphony Orchestra all call Miami home. Art museums including UM’s own Lowe Art Museum, the Miami Art Museum and the more than 100 art galleries in Coral Gables and Miami Beach makes South Florida an art-lovers haven. The many concert venues makes South Florida a stop on nearly all of the major concert tours. Coral Cay Plantation of Margate is nestled among natural Florida landscape including orange and grapefruit trees, slash pine and majestic oak trees. Residents enjoy beautiful waterfront living with easy access to South Florida's inter-coastal waterways. Shopping, spectator sports, including Miami Heat basketball and Florida Marlins baseball, and the Sunrise Music Theatre are all located within a few miles of the community. Affordable new homes are available at Coral Cay Plantation.